The best way to judge a scientific theory is to examine the predictions it makes about the observable universe. The more its predictions line up with the data, the more reliable the theory becomes. The less its predictions line up with the data, the less reliable the theory becomes. Since starting this blog, I have pointed out many instances where the predictions of evolutionary theory don’t line up with the observable data (here, here, here, here, here, and here). Dr. Hunter has an excellent review of several other instances. Now we can add yet another failed evolutionary prediction to this ever-growing list. The animal pictured above is Mnemiopsis leidyi, a species of comb jelly. According to evolutionary theory, the comb jellies are “primitive.” Based on genetics, they are supposed to have evolved before some of the simplest animals on the planet: sponges. Even if you don’t believe the genetic arguments, most evolutionists would agree that comb jellies evolved well before the more “advanced” animals, such as roundworms. One of the things that separates these “primitive” animals from the more “advanced” animals is their digestive tract. In animals like jellyfish and sponges, there is only one opening in the digestive tract. The animal must use that opening to take in food, and then later it must use the same opening to expel indigestible waste. According to the story of evolution, this “simple” digestive tract was the first to evolve, and then later, a more “advanced” digestive tract formed. In this more “advanced” digestive tract, there is one opening for taking in food and a different opening for expelling indigestible waste. Since comb jellies are suppose to be among the “primitive” animals, evolution predicts that they should have “simple” digestive tracts. However, recent videos demonstrate that this evolutionary prediction is (not surprisingly) wrong. Comb jellies are part of phylum Ctenophora, and some of the biologists who study them recently attended a convention that is appropriately named Ctenopalooza. One of the speakers at that convention was Dr. William Browne. During a presentation, he showed two videos of two different comb jellies: Mnemiopsis leidyi (shown in the picture above) and Pleurobrachia bachei. According to one report, the videos “elicited gasps from the audience,” because they showed the comb jellies taking in food through one opening, and then expelling indigestible waste from a completely different opening. In other words, these videos showed that at least two species of comb jellies don’t have “simple” digestive tracts. Instead, they have digestive tracts that are supposed to be characteristic of “more advanced” animals, like roundworms. It’s not surprising that this revelation elicited gasps from the audience, because the majority of those in attendance no doubt think that evolution is a good scientific theory. Thus, they are inclined to believe the predictions of evolution, and evolution clearly predicts that comb jellies should have “simple” digestive tracts. Now please understand that to true believers, the fact that yet another evolutionary prediction has been falsified isn’t a big deal. Indeed, the same report that described the audience’s reaction at Ctenopalooza already started trying to explain around this falsified prediction. 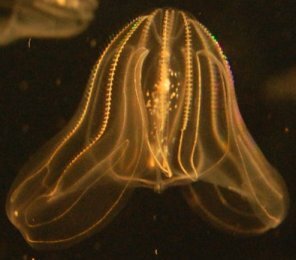 It’s possible, the report suggests, that comb jellies evolved an “advanced” digestive tract independently of the other animals that have it. While adding such an epicycle forces evolutionary theory to be consistent with the known data, it doesn’t erase the fact that this is yet another example of a failed evolutionary prediction. The more research is done the more it betrays evolutiony predictions or presumptions. i got a hunch more are coming as people get smarter about raw data alone. This is a good point. Its also a good point no creatures are primitive. They all couldn’t be whipped up in a well supplied lab. Simply because biologists that accept evolution state that something is primitive (which means old, not lacking in substance) by no means says that it is not complex. I agree, a tabor. However, that’s not what I said in the article. According to evolutionists, comb jellies evolved BEFORE the two-hole digestive system evolved. Thus, evolutionists predicted that they should not have a two-hole digestive system. Indeed, that’s why the videos showing that they do have a two-hole digestive system elicited gasps from the audience. What are saying is true. However if your intent is that these people believe in Christ and , thus, be saved. They are not going to be saved by you proving them wrong. If anything they will dislike you more. Some of these people are loyal to what they choose to believe even if they know is false. You are correct, Mauricio. However, it is important for Christians to promote good science, which is what I am doing on this blog. Fowler, S.R. and Zeidler, D.L., 2016. Lack of Evolution Acceptance Inhibits Students’ Negotiation of Biology-based Socioscientific Issues. Journal of Biological Education, pp.1-18. is claiming that those who reject biological evolution have a worse understanding of biology. I’ve often times heard quite the opposite, and seen data saying the opposite. Do you have some blog posts or data I can pass along to them to the contrary? Thanks. I haven’t read the study, Tim, but it seems to me that it would be hard to judge a person’s understanding of biology based on the three questions that were asked. The study definitely goes against the results of this study, which found that a student’s belief in evolution was not correlated with his or her understanding of it. In addition, this blog post from an evolution supporter discusses a book that gathers several statistics which show belief in evolution is not correlated with knowledge of biology. Finally, I would point out the case of Patrick Henry College, whose students are mostly young-earth creationists but score very high on the ETS natural sciences test, which is heavily focused on biology. Simply saying something is primitive and at the same time complex does not disprove evolutionary predictions. Read Climbing Mount Improbable. Dawkins (this time refraining from his piss poor areligious apologetics) shows that simply because something has not evolved does not disprove evolutionary theory, simply because not all environments require evolution over long periods of time, eons even. Please read the post, a tabor. I am not saying that comb jellies are primitive and at the same time complex. I am saying that comb jellies were supposed to have evolved before the two-hole digestive system evolved. Thus, they are not supposed to have a two-holed digestive system. That’s clearly the prediction of evolution, which is why the video elicited gasps from the audience. The audience members believed the evolutionary prediction, and they gasped when they saw that it was falsified. I have read every book by Dawkins, including Climbing Mount Improbable. It certainly is better than his later nonsense, but it makes an incredibly poor case for evolution. The only thing I gathered from Sarfati’s review of Climbing Mount Improbable is the fact he relies on the assumption that mutation rates are very low and that the probability of it occurring is also very low. Though it can at first seem like a good case, I think that Sarfati forgets the fact that there are entirely different ways something could have evolved, thus increasing the probability in the first place. I read the post. Your assertion is correct.